As regular DIYBIKING.COM readers know, I gave myself a challenge for National Bike Month (which was, um, last month): ride a $20 bike bought at a garage sale a minimum of 112 miles on trips that I would only normally use the car. The 112 miles was calculated based on the fact my Honda Element costs about $0.18 per mile to run and there would be no pleasure rides involved at all. I even found a $1 bill in the street while riding the bike to the hardware store and, after careful consideration, did not apply that dollar (which wouldn't have been seen, let alone found, if I drove the car) to the $20 goal. Thanks to riding to and from work, the hardware store, and to Exhale Spa in Stamford so I could pleasantly torture my non-flexible joints in a yoga class, I managed to rack up a good number of miles. Now a week ago today, I wanted to use the bike for practical purposes but a certain annoying tropical storm named Andrea - we're 1/26th of the way through the alphabet in storm season and already having problems - kept me off the bike. This is the door in that leads into the landing that leads out of the garage. It's little more than a several rotting planks of wood with some insulation stapled on it. I decided to replace it, which meant the stuff stored in the landing had to move out into the rest of the basement. I know, it's pretty bad: pepper a couple of forgotten dead pets around and it could be a season finale of 'Hoarders' in the making. So that Friday was spent in the shop. By Saturday, it was beautiful out, but I had to go to Cranford, New Jersey as my artist wife was participating in the quick draw portion of the Paint the Town event there. 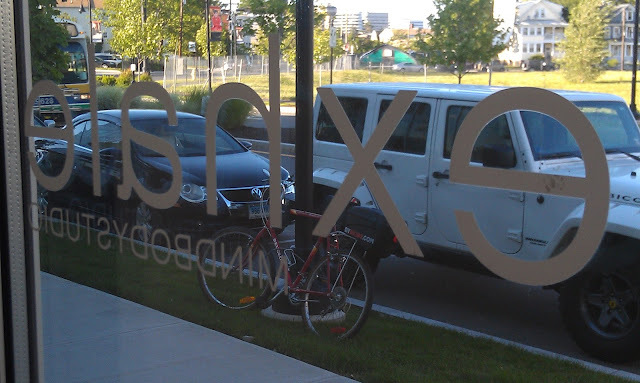 I could have cheated and brought the Peugeot, but this was a pleasure ride, and that meant a pleasure bike: I took the Bike Friday and managed a 12 mile trip (and an unexpected stop at the very nice Jay's Cycle Center in Westfield) before returning to town in time to see my wife's painting on display with more than 70 others. The following day (this past Sunday) I woke up and realized that lousy weather forecast for the week meant I wouldn't be able to bike to work as often as I'd like, which meant there'd be at least one more weekend to go before reaching my 112 mile goal. I didn't feel like taking a pleasure ride - especially since the shop was still an awful mess and I had a long Home Depot shopping list. Among the things I needed were door trim pieces for the new basement door, so I decided I couldn't take the bike for this trip. Yes, I hitched the trailer - last seen promoting Person-to-Person's Stamford Take Off Your Clothes clothing drive - to the Peugeot and set off. It was a good eight miles to get to Home Depot in Norwalk. 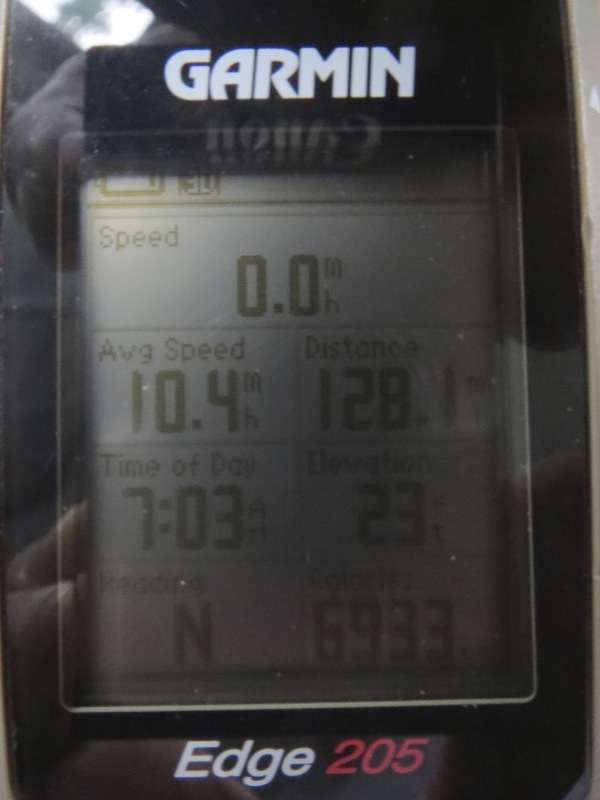 On the way there, the bike's odometer hit 100 miles. Because I reset the trip every time I use my Garmin (prior to the challenge) it was the first time I had seen that happen since I did a century in 2007. After I arrived and locked the bike up, I pushed the shopping trolley around the store and was fortunately able to find what I needed quickly. The first find was the 4' metal thresholds I needed. The 80" long door trim pieces came in a convenient, shrink-wrapped kit and I had to steady it as I headed to the register. As I was checking out, it was a little fun to see the clerk look from the bike helmet I was holding to the shopping trolley and back again. Helmet. Trolley. Helmet. Trolley. Like he was watching a tennis match. I told him yes, and answered his follow up question ('How are you gonna balance all this stuff?') by telling him I had a trailer. I didn't just bring a trailer, mind you: I had duct tape and several bungee cords to secure my cargo, plus a big blue IKEA bag to put all of my small goods in. Several people in Ford Econoline vans and Chevy Suburbans stared as they rolled past. Probably mad they didn't think of this first. Once I had everything secured, I realized something was missing: when I was little and my dad and I would return from a lumberyard with stuff sticking out the back of the van, he'd attach a little flag to the end as a warning to other motorists. I didn't have a flag, but I did have a little red piece of Velcro that I use to keep the chain from staining my trouser cuff. Since I was wearing bike shorts that day, I didn't need it. Wary of the potential for embarrassment, I continuously looked over my shoulder as I headed back from Norwalk. I could feel the weight of the cargo on each uphill, but the bungee cords and duct tape held it all in place. Each mile fell away and I was glad I didn't take the car. Before I knew it I was pedaling up my street. When I stopped in front of my house I looked at the GPS. I paid for the Peugeot! 112.5 miles with no signs of real wear. An average speed of 10.3 miles an hour (not ideal for the Pacific Swim Bike Run rides, but fine for practical trips) and more than 6,000 calories burned. 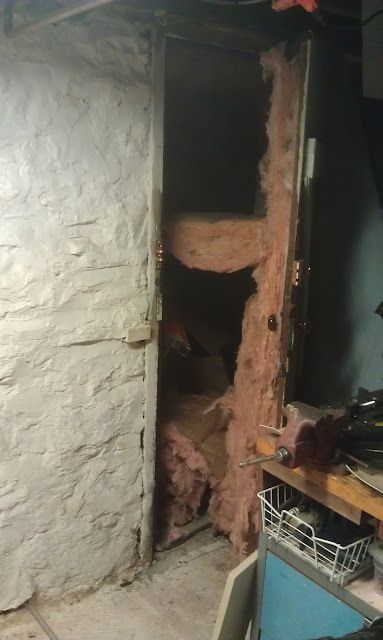 Later that same day, I installed and painted the trim pieces, and I now officially had a useable exterior door in the basement. It opens at the turn of a knob. It closes as well. I was satisfied that the Peugeot finished the challenge in a blaze of glory. But the exercise got me to thinking that there are a lot more possibilities, a lot more chances, a lot more travel that can be done with a bike instead of a car. This Peugeot challenge got my brain to think about it more, and whether you have a $20 garage sale bike or not, please try to train your brain to think about using the bike more often and the car less often. You'll be glad you did. Thanks for reading and thanks for riding.